Hydropower is one of the most well-known and important renewable energy sources that we can use to power our homes and not cause the environment any trouble. However, not many people are familiar with the mechanism behind a hydroelectric power plant and how this man-made miracle manages to provide us with clean and renewable energy. Today, we are going to explore precisely that. We are going to be looking at what hydropower is based on, how we harness it, what are the main components of a hydroelectric power plant, and how a simple hydroelectric dam can power our house in no time. Let’s begin! Since we couldn’t be talking about how a hydroelectric dam provides us with electricity without first knowing what exactly hydropower is, we will first take a look at its definition. Hydropower is basically power that we harness from falling water. How does this energy coming from water generates electricity, you ask? Well, a turbine works to convert what we call kinetic energy into mechanical energy. Next comes the generator’s job, which is to turn said mechanical energy we just got into electrical energy. If you think about it, the process doesn’t sound so difficult, right? Well, a lot of work actually goes into the processes that turns kinetic energy coming from falling water into electricity for our homes. Next, we are going to explore these processes further. Hydroelectric power plants is where all the magic happens. The plants can be huge and power entire cities and areas, or they can be small (micro-hydros) and power only a few homes. However, typically, a hydroelectric power plant contains 4 main components: a hydroelectric dam, a turbine, a generator, and transmission lines. The first and most important component of a hydroelectric power plant is the hydroelectric dam. That is because it is basically here where the whole process starts. Since we are more interested in finding out how a hydroelectric dam can power our homes, we are going to take a closer look at the way it actually works. First of all, you should know that a dam too consists of several main parts: a reservoir, a gate, and a penstock. The reservoir is where we store the water that we will use to create electricity. The amount of electricity we get is proportional to the amount of water that we store in the reservoir. Then, the gate serves an obvious purpose. That of blocking the water we collect in the reservoir, and later releasing it for electricity purposes. Finally, the penstock is how the water goes from the reservoir to the turbines. That is where kinetic energy turns into mechanical energy. In order for the dam to be efficient, the specialists who build it have to pay a lot of attention to the diameter and slope of the penstock. How Much Power Can I Get from a Hydroelectric Dam? If you are curious about how strong a hydroelectric dam actually is, you should know that the amount of energy you can get from it is dependent on two main things. The first one is, of course, the amount of water that falls from the reservoir to the turbine. The more water that it falls, the more electricity you will eventually get. However, the amount of water we can use depends on how much water the river where we built the power plant has. So if the river is bigger and has a lot of flowing water, we will get a lot of energy as well. The second factor is the distance from which the water falls. If the water falls from a greater distance, we will produce much more electricity. If we want this to happen, what we have to do is build a taller dam. That way, the water has plenty of room to fall unencumbered. Now, let’s see why more and more people are opening up to the idea of hydroelectric dams. Is it because they come with a lot of advantages? Probably. For instance, if we use a hydroelectric dam to get clean and renewable energy, we will also pay less money on electricity. Indeed, we need to consider the initial investment, because it can be quite pricey. However, if we put things into perspective, we will reach the conclusion that the pros of a hydroelectric dam outweigh the cons. That is because after paying a sum of money to build the power plant, the entire process of turning kinetic energy into electricity is quite inexpensive. A hydroelectric power plant does not require a lot of maintenance. Nor does it need any fossil fuel that we have to pay for. In fact, water is the only fuel we need. Not to mention that once we build such a power plant, we can benefit from it for decades. This will definitely compensate for our initial investment. Another advantage relates to the health of our environment, and as a result, to our health as well. A hydroelectric dam does not release any greenhouse gases or other forms of pollution. Now, we all know how dangerous greenhouse gases can be, and how they contribute to global warming and climate change. Of course the instinct we have is to protect our planet from such dangerous gases. Well, a hydroelectric dam is a great way to do that. We will not pollute the air, the soil, and much less the water. We won’t even waste the water, if this is what you were worried about. Since a power plant serves as an apparatus that converts kinetic energy coming from falling water into mechanical energy and later electricity, the water itself doesn’t change in the least. It simply goes back to the source and we can use it again. Which is precisely why we call this type of energy source renewable, because we can use it over and over again and not fear that we will waste it. As with any type of renewable energy source, there have to be some disadvantages too when it comes to hydroelectric dams. For instance, one of them is the fact that building a dam might affect the ecosystem. As a result, we will displace fish from their natural habitat, and this will disrupt their development. Furthermore, humans might also lose their homes, since larger hydroelectric dams require a lot of free space. Sometimes, entire cities or areas are asked to relocate for people to build a hydroelectric dam. However, this is safer for them. Sometimes, when the dam releases water, certain surrounding areas might have to deal with floods. Along the same lines, if the dam ever breaks, there will be no human losses if there are no human settlements around. Remember when we were talking about the 4 components of a hydroelectric power plant? Well, now that we’ve explicitly covered what a hydroelectric dam is and how we can benefit from it, it is time to move on to the next component, namely the turbine. If you want to imagine how a turbine works, you just have to think of a windmill. It follows the same principles, except it doesn’t use wind, it uses water. The falling water pushes against the turbine, which causes it to start spinning. Once the water sets the turbine blades in motion, all the kinetic energy coming from it turns into mechanical energy. Of course, no hydroelectric power plant would be complete without a generator. After all, the generator is what actually turns mechanical energy into electricity. When we build a power plant, we connect the turbine to the generator by using shafts and gears. That is why, when the turbines start spinning because of the force of falling water, the generator starts spinning as well. 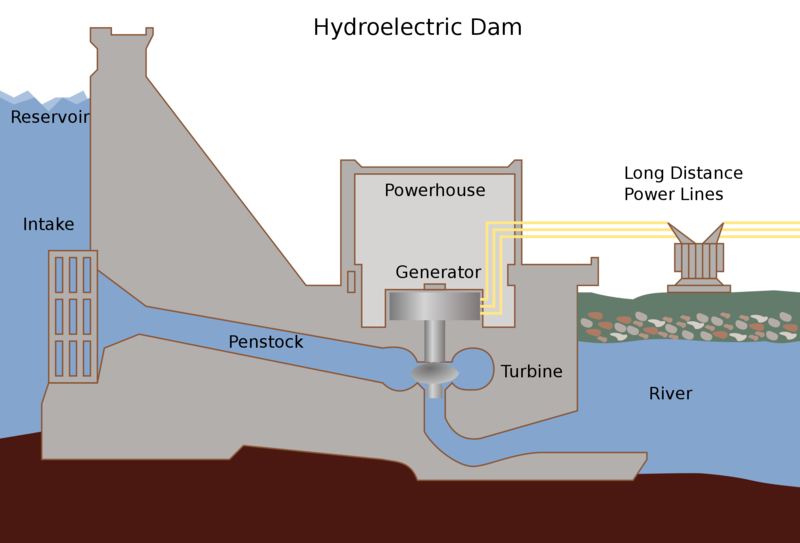 Are you confused about how a hydroelectric generator works? Well, you should know that it works like any kind of generator, even the ones we find in coal power plants for instance. This regular generator is what ultimately provides our homes with electricity. Finally, transmission lines are vital to a hydroelectric power plant, because they carry the newly created electricity from the generator to our homes. Of course, it doesn’t have to necessarily be a home, it can be an office, an institution, or whatever other building that could benefit from a renewable energy source. Hydropower is definitely a renewable energy source that we should harness more and more if we want to limit the effects of pollution on global warming and climate change. As we hope we’ve managed to show today, the way a hydroelectric dam powers our homes and businesses is quite fascinating. Even though there is a lot of work that goes into building a hydroelectric power plant, and it can have some negative consequences as well, we believe the entire mechanism definitely improves our quality of life. All we have to do is work to perfect the system and try to eliminate the negative aspects that might determine people to lose confidence in this type of renewable energy.